peace – God's Grace ~ God's Glory! Being awake at 2:30 this morning is a good time for me to write about the subject of sleeplessness. I was in bed since 10:00 P.M. so I have slept. After 78 years, I am experienced and have learned to live with the occasional nights when it is difficult to fall asleep; or when I wake up early in the morning. How we handle each of these episodes depends on how we view this state in our lives. At times, when younger, there were many different things going on that kept me awake; and I would worry, not only about the things, but about the sleeplessness. I feel led to write about this dilemma. There seems to be an epidemic. There are sleep centers available for this problem. First, I believe that it is a result of the condition of our world, which is enough to keep everybody awake. Maybe we should all stay awake and pray for God to “rend the heavens, and come down; as the melting fire burneth; and make His name known among the adversaries” (Isaiah 66:1). Our culture should not, however, keep us, as God’s children, awake and anxious. Sleeplessness should not be the norm for the Christian. Going through bouts of insomnia has been a learning and growing experience for me. God’s word and Spirit have become more powerful in and through me during these times. They have strengthened me to survive and thrive even when I have not had a good night’s sleep. Many mornings I had to accompany with piano for a worship service after only a little sleep. Colossians 1:9-14 became real as I meditated on Paul’s prayer for those of the early church. He prayed that you may be filled with the knowledge of his will in all spiritual wisdom and understanding, so as to walk in a manner worthy of the Lord, fully pleasing to him, bearing fruit in every good work and increasing in the knowledge of God. May you be strengthened with all power, according to his glorious might, for all endurance and patience with joy,  giving thanks to the Father, who has qualified you to share in the inheritance of the saints in light. He has delivered us from the domain of darkness and transferred us to the kingdom of his beloved Son, in whom we have redemption, the forgiveness of sins. Verse 10 in bold print was the word I needed for the day. Sleep may have sufficed for me to serve, but sleeplessness was a means of grace to lay hold of God’s power. I have experienced more strength from Him when I needed it, than from a regular night’s sleep. I can speak here from a time when I was younger, plagued with insomnia; before my conversion. My whole life was planned around my own desires. Things were not working in my life as I had hoped. There was no peace in my heart; sleeplessness was simply my nighttime restlessness. The days were not much better than the nights. In this short treatise I will attempt, by God’s grace, to address causes and solutions to this problem. Not being a professional counselor or physician I speak only as I have learned. How we sleep depends on how we live. How we live does not depend on how we sleep. Many excuses come from our not getting enough sleep. Enough is not the same for every person. Some do not require as much sleep as others. We should not be envious of those who can sleep anytime, anywhere, at the drop of a hat. They are blessed in some ways that we are not. But, we may, in our being awake, be blessed in other ways. Christ may return while we are awake. Those who are sleeping may miss His first call. So, at this point, let me encourage you, the reader, to look at your state of sleeplessness as God’s means of doing something in your life that you would not experience, otherwise. God has a purpose for your insomnia, as for all things. For the Christian, “everything works together for good, for those who love Him. For those whom He foreknew He predestined to be conformed to the image of His dear Son” (Romans 8:28-29). God speaks to every dilemma in our lives. It is all part of His working for our good and for His glory. Remembering that there is purpose in our being awake or sleeping, let’s look at some possible reasons for our not being able to sleep when we want to. My list over the years have included occasional indigestion or illness, busy schedule, uncertainty, difficulty in relationships, finances, new plans, grief, overstimulation, unforgiveness, anger, jealousy, or other unconfessed sins. Any of these, and others that you may know, easily displace the peace that God gives us as His children, in Christ. Our awakeness may be the time for awareness of what we need to address in our daily living. God speaks in all ages and stages. We should ask for His wisdom; for what He wants us to know at every stage. If we are not sleeping, we ask Him to make us aware of what we need. If we cannot change what needs to be changed we pray that He bring the changes; or enable us to accept what cannot be changed. We can break down my list and look at everything separately; but we will soon come to the same conclusion. In everything God has His plans for us. Awareness of what is keeping us awake is the first step that brings us to the Lord. Presenting these of which we are aware to Him, wrestling in prayer, we will soon be tired and resting in Him. Peace comes when all is given to Him. It may be that these times are God’s planning for you to experience His presence. In the stillness and quietness of the night there is a solitude with which most people are not acquainted. It is this sanctuary that God uses when we are not otherwise silent before Him. God can sometimes meet us here, when we are nor available during the day. It may be to teach us not only to rely on Him for all things, His plans, His will, His way, but to establish a relationship that carries through the day and night. Many nights I wake and wait for His presence; to know what special blessings He wants to give; for songs in the night come, especially when I am at peace with Him. I have learned that all that I am is His, my waking and my sleeping. He never sleeps so we can have that sweet fellowship anytime. When I stopped fighting the sleeplessness, stopped counting sheep, and starting looking for Him to speak to me I no longer was concerned about sleeping. As I have gotten older I realize that patterns make a difference in our days and nights. Even if we are at peace, trusting God in all things, in obedience of faith in all that we know; how we plan for sleep helps. I do not sleep well when my evening has been hectic. Overstimulation of any kind, talking on the phone for an extended time, caught up in a project, or anything unusual, will keep me from sleeping. Reading God’s promises, prayer before bedtime and the review of a hymn or Psalm that we will sing next Lord’s Day is part of worship before bedtime. Overeating at dinner or going to bed on an empty stomach are not good habits for me. What I eat makes a difference. By this age I know what my body will tolerate. I know my limitations of food and drink. A dark room seems to be best. Light tends to wakefulness. It is similar to prayer, in that we are shutting out the world and any artificial light. Jerry has always gone to bed earlier, and I get to bed as early as possible. Establishing a regular schedule makes it is easier to get up early, even if I don’t get a good night’s sleep. Even now, I may lie back down and have a nap before the dawn of this new day, Lord willing. Either way, my day is dependent on His strength, power and glorious might ~ His Spirit in me ~ “Christ in me, the hope of glory.” When we truly understand and experience this truth, sleep does not matter ~ only Christ. Precious heavenly Father, Creator, Redeemer and sustainer of all living things, so make Christ real in our hearts and lives that we rejoice in Him, even in our sleeplessness. In every waking moment, make us to know your presence, use all our time to fill us with your grace. Wrap us in the glory of the one who lived for us, died for us, was raised for us, and now reigns for us, continuing to teach us. Help us to remember this life as preparation for eternity with you. Fill us with your Holy Spirit of love, joy and peace, for your glory and our joy. In Jesus’ name I pray. Amen. Forgiveness is a revolving grace that begins with God, working His love and forgiveness in us, and through us to others. Subsequently, we can confidently ask for forgiveness for our own indebtedness to Him, which is more than anyone could owe us. This grace is characteristic of God’s people, those who share space in His kingdom. How can we not love and forgive, when our Father has forgiven us? Is there bitterness in your heart toward God or another person? Resentment is the spirit of oppression, and the enemy’s greatest weapon, working from within to destroy. The condition of any single life, family, or nation, can be summed up in the total of our grievances and vengeance against others. We are concerned about our freedom here in America. We are already in bonds to the oppressive spirit that rules in the hearts and minds of men. What we see from those who desire to govern this nation is the same spirit of this nation. We are in need of God’s intervention by His Spirit to bring us to repentance, to lead us in truth and righteousness; to overcome this spirit within us. Our nation and the world will remain under threat until we learn to live in love and care for our heavenly Father, our Lord Jesus Christ, and each other. Let us consider and examine our own hearts to know for sure that we have trusted the heavenly Father’s love and forgiveness for us. Gracious Father, forgive us of our rebellion, our pride, and covetousness; forgive us our anxieties and unbelief. Forgive us our discontent and impatience; forgive us our neglect and slothfulness. We need you to examine our hearts, to try our thoughts, to know if there is any bitterness that we hold against you or any other person. Reveal your love and forgiveness to us by the power of your Holy Spirit. Bring us to repentance, that we may trust you in all things, to live in peace with you and our fellowman. Heal hearts in this nation and other nations by the peace of your Son, in whose name I pray. Amen. And look into His eyes. Our Father has for me. Where no human feet have trod. There’s room for every one. He knows each heart; He knows each name. Not one I’ve heard before. He’s more, oh, so much more. What can be seen, even now. It forms a human shelf. Until His work was done. He suffered for His own. For now and later on. The heart, spirit, and life of a Christian are different than an ordinary person’s life. There is an extraordinary, supernatural working of God’s grace that reforms and transforms the center of all things. It is inbred and expressed outwardly by the Holy Spirit of God. It is the life of Christ that is manifest within and without, permeating the whole being and perpetuating forever a new creation through which He reveals His grace and His glory. 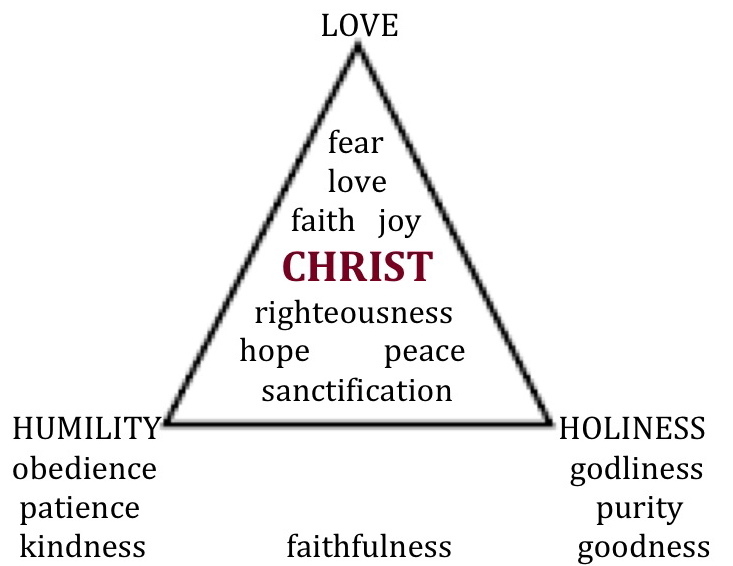 Here we suggest three main factors of a true Christian life that radiates from Christ within us. Love, humility and holiness are the evidence of the new heart and spirit that were promised in Ezekiel 36:26, God’s working of new life in a fallen world. 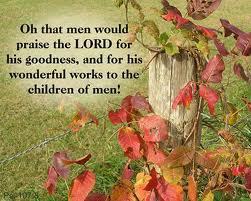 All that God promised since the fall is being fulfilled by the Spirit of Christ through His people, restoring His image through the life and work of Christ for their salvation and His glory. Knowledge and truth are included in this triangle, as Christ, Himself, is “the way, the truth, and the life.” (John 14:6) It is in His word, the written word, The Holy Bible, and the living word, Jesus Christ, that we know God, His purpose for our creation and redemption. It is His means of revealing Himself and the work of grace within us. By our reading, study, meditation and memorization He shows us what He is doing; throughout our lives revealing and fulfilling His plans for us, in us, and through us. LOVE ~ the love of God, the Father, is evidence from His own heart and nature given to each of His children. This love, unlike any of our own imaginations of love, is the new nature. It is the root and the fruit of all that God is and does; and works in all to whom He has given the heart and spirit of Christ. Love works in every area of the new life. Through His revelation of our justification, forgiveness and restoration in Christ we see the evidence of His love (1 John 4:10), and the working of this love through us for Him and for others (1 John 3:16). HUMILITY ~ the humility of the Father and the Son, Jesus Christ, who gave Himself to suffer and sacrifice His life for us that we might bear His image, His nature and disposition. Obedience of faith, patience, kindness, and faithfulness are the results of Christ’s humility in and through us. We see His humility and ours in Philippians 2:3-8. HOLINESS ~ the outward working of Christ and the Holy Spirit in the life of the Christian; a return to God of what He has given; the evidence to the angels in heaven and to the world of the difference in the life of a Christian. This is a purity and a goodness that only God can work in the human life. Dear Father in heaven, what mercy you have shown us, and that you continue to work in us. Fill us anew today with your Spirit; with the life of Christ, to know and do your will. Through us reveal to others the magnitude of your grace ~ for your glory and our joy. In Jesus’ name I pray. Amen.